Looks good, i like the non-military (they all seem to be gentry) of your characters. Little background bits that you provided are definitly helping to flesh out Kandha. Blood-Druid was especially interesting. Commander Shadow wrote: Looks good, i like the non-military (they all seem to be gentry) of your characters. Little background bits that you provided are definitly helping to flesh out Kandha. Blood-Druid was especially interesting. I'll get the others done. What i've come to learn of late is that no matter what scenario your character is in, what he is, or what the story is about, the reader wants to get to know the real person on the inside, and to flesh that out as much as you can while at the same time keeping the pace and rhymth. Just expanding my list of characters. The Navy and Argi-world next. Background history: Dioua is the highest ranking soldier on Kandah, commanding a PDF force of no less than a thousand men, but despite the large number, the force is distributed evenly across the continent. From his headquarters, the Rork outpost; an offshore fort built in and on top of a giant rock, a work of considerable achievements. From the Rork outpost, Dioua personally commands around three hundred men at his disposal. Mostly a pencil pusher, Dioua fills out forms and gives out orders for his men to do the regular patrols to monitor the “natives” activities. Background history: A speed freak to boot, Kylou enjoys nothing more than to have the control stick of a fast moving object in his hand, and this habit hasn’t changed in his time at the Rork outpost. Background: A new recruit, Rhoi has spent the last six months training as a cadet for the PDF. Rhoi is the younger of two daughters, and strives to be the best in everything. While the initial training was particular hard, Rhoi nonetheless overcame the obstacles put ahead of her. However, despite her skills and qualifications as a good soldier, Rhoi finds it hard to work with others, preferring to do things solo. Wanting her to the learn value of teamwork, and to get instil some field experience, Rhoi has been transferred to the Rork outpost. these ones look good. I noticed there's a lack of officers in command of large scale units (companies and the like). Were these to be you're major characters then? Will there be any local Kandahi Guardsmen (maybe some that were to ship off world when sector command was allocating forces and were sent to defend their homeworld). I look forwards to the Navy characters. In terms of deployment i was thinking the Fenn Regiments would be garisoned on Ullor and use trench warfare with the Ullorian PDF and regiments to protect major population centers. Likewise the Olympian and Valdorian Regiments would be situated on the more heavily populated/industrialized Lunda. I'll pm you the tactical details. Also i was thinking since we will probably be describing Lundani, Kandahi, Ullorian, Olympian, Valdorian, and Fennari soldiers we could describe what their combat/dress uniforms look like and what the people themselves generally look like (in the ethnic sense). also: (Re: The RIAR) haha, no problem. Writing is supposed to be fun, people commenting on my work (whether good or bad) always makes me feel like im accomplishing something. Critique is good. what do you think? I could come up with what the Olympians, Valdorians, and Fennari look like. Do you want to come up with the others? Commander Shadow wrote: these ones look good. I noticed there's a lack of officers in command of large scale units (companies and the like). Were these to be you're major characters then? Will there be any local Kandahi Guardsmen (maybe some that were to ship off world when sector command was allocating forces and were sent to defend their homeworld). The way i'm thinking at the moment, the PDF garrison on Kandah is quite small to that of the other planets. In total, there is 1000 soldiers, but they're evenly spread. Besides obviously policing the place for Imperial interests, the world acts as a sort of training ground for PDF units to go out into the field. 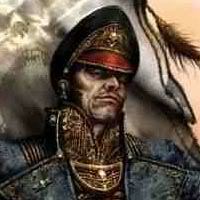 Naturally the Imperium will pool in the soldiers it can find in order to fight for it, and its no less different here. Warriors regularly sign up to join the war effort for the Imperium, but they're are slightly more cultured and more controlable than the majority of them, who, despite regarding the Imperium's men with reverence, have a slight distrust for them, knowing full well of their low opinion of them. Thank, i'll work on them as soon as possible. Yeah, making their differences widely known to the reader. Which others are you talking about? Oh, for the others i was thinking the local regiments, Lundani, Kandahi, and Ullorian. I'd especially like you're take on the Kandahi as i was thinking of writing the "bar fight" scene next. Uniforms: sky blue pants and jackets (silver piping), black undershirts [dress uniform] Urban dark/light blue camoflage when in combat. They also wear flack-jackets. Olympia is a hive world. They generally have a "greek like" look to them, short, hairy, olive skin and dark hair. The average trooper is probably middle or lower hives, maybe even underhive. But they are feircely loyal to other olympians, even if they dont know them. Loyal to officers if they are good ones. Discipline is enforced by commissars. Uniforms: Dune colored jackets with white pants and white undershirts [Dress] brown and khaki urban camoflage when in combat on Lunda (its an industrial world, thus urban combat). They also wear flack-jackets. They come from a heavily industrialized world (thus they are mainly armored an mechanized formations), the officer caste is almost entirely decendents of the merchant class and gentry while the infantry and Non Coms are working class. For the most part they are thin, wiry, with silvery blond hair. Kinda in apearance to Germans. Uniform: Regular soldiers are dressed in a mix of scavenged, non-standard issue equipment generally revolving around long dark-brown great coats with stamped bowl metal helmets or forage caps. Most of them wear flack-jackets if they can get them, otherwise they have thick leather armor or even scavenged metal. The officers (all noblity) wear finely crafted carapace armor and peaked officer caps when in the field. Their dress uniforms varry from unit to unit but are generally black or dark gray with various embroidered finery from their feifs or manors. Fenn is a heavily populated feudal world with lords and their vassals serving the Emperor's Regent. On vast agricultural estates serfs spend their lifes tending the feilds. apart from manors and castles there is only a handful of major cities on the world, these are centers of the Ecclesiarchy dominated by massive cathedrals where the God-Emperor's word is preached to all who hear. Throughout the countryside other such massive sites tower over castles and feilds. Every few years the Imperium levies new regiments from Fenn, the sons of lords and vassals the officers and the serfs their soldiers. The gentry are tall broad and arrogant, yet regal looking. Some of the officers are of the merchant middle class but they are generally shunned and keep to themselves. The average soldier is short, stocky, not particularly bright (not well educated) but completely faithful. The strenght of Fennari Regiments does not lie in their discipline or tactics but in their grinding war of attrition and their blind faith. I like what i've read of the difference Imperial Guard regiments, very diverse and multicultural. thanks, do you want to come up with the look for the local regiments and PDF? I posted the Prologue up on the group story thread and now can start writing my first part of the first section (chapter?). You want to start working on your part? I was thinking each section (split along the gameplan you put up) could have maybe four or six different posts in it, that way neither of us would have to write anything truely massive and we could explore different characters as well as push the story forwards. Did you get my PM Shadow? any eta on when that would be?